Profile: Bruticus is a model soldier. He performs his tasks with the cool, efficient, unquestioning manner that would bring an auditory module to auditory module smile to the face of any military commander. He knows how to follow orders. But he's not very good at taking initiative on his own. In fact, he's liable to stand around looking confused in the middle of a battle if nobody is there to tell him what to do. Still, he represents a fairly successful merging of the minds and personalities of the five Combaticons - Brawl, Swindle, Blast Off, Vortex and Onslaught - who comprise him. Whether he's just crushing an Autobot, or flattening a whole team of them, Bruticus just does his job. "I like him," says Decepticon Leader Megatron. "I wish I had a whole army of Bruticuses!" Luckily for the Autobots, he doesn't. 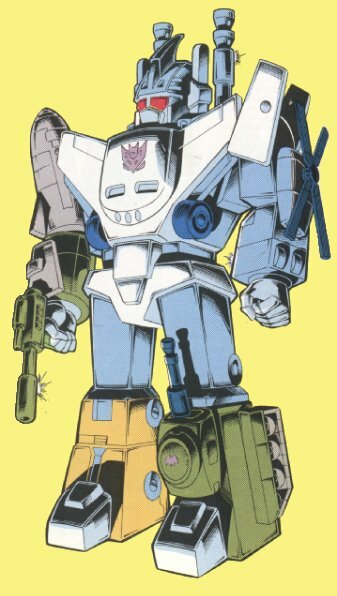 Abilities: Bruticus is incredibly strong. He can pulverize a suspension bridge with one 14,000 psi punch. He can lift up to 500,000 pounds. He uses Onslaught's powerful sonic stun-gun, which can smash a hillside to dust with a single blast. His armor is impervious to most artillery and radiation. Weaknesses: Bruticus is slow and not very agile. He makes an easy target. He is not a creative thinker, and can sometimes even be a hindrance in battle if not properly prepared with instructions.